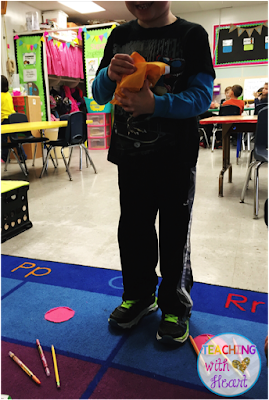 Teaching With Heart: Kicking off Addition Kindergarten Style! Kicking off Addition Kindergarten Style! Addition is one of my favorite math units to teach, mainly because there are tons of fun and engaging games that your kids can play to help strengthen their addition fluency. 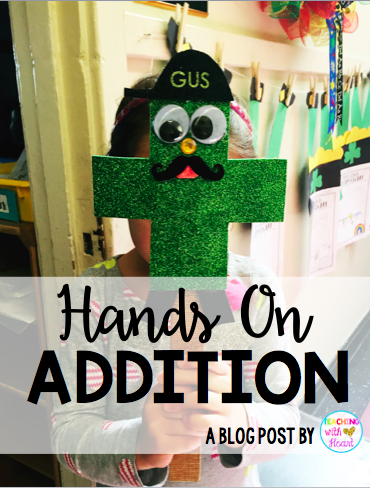 Last week, we began our addition unit, and I was lucky to learn even MORE engaging activities that you can use to teach and practice addition! Here's a peek at our first week of addition, as well as some extra games and activities that you can use throughout the unit to keep your students engaged and having tons of fun! We started our first day of addition by exploring what it MEANS to add. We talked a lot about how adding means taking two groups and joining them together to make one, BIGGER group. We didn't even touch upon plus and equals yet. We used a lot of language that sounded like this: 3 and 1 makes 4. 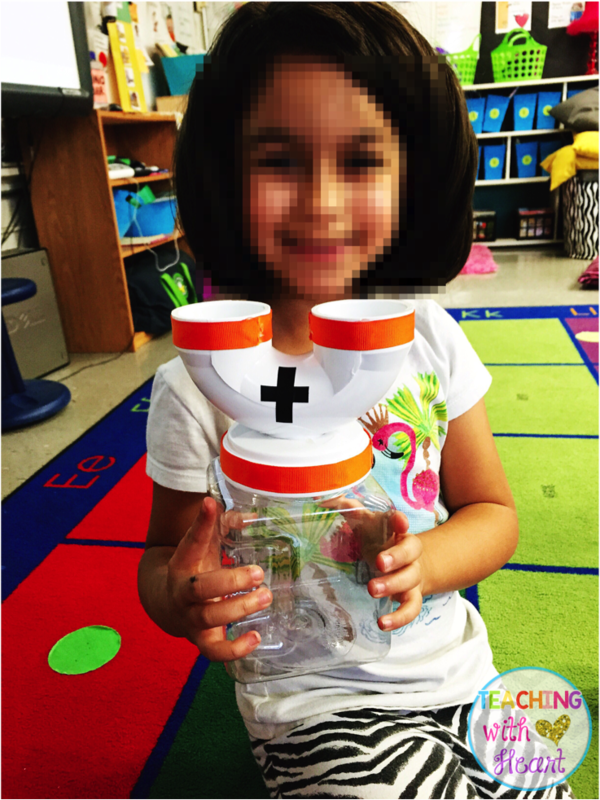 On this first day, I introduced our addition machine. I introduced it in our whole group mini lesson so the kids could see how my two groups (in the orange cups) were poured into the white bin to become one group. 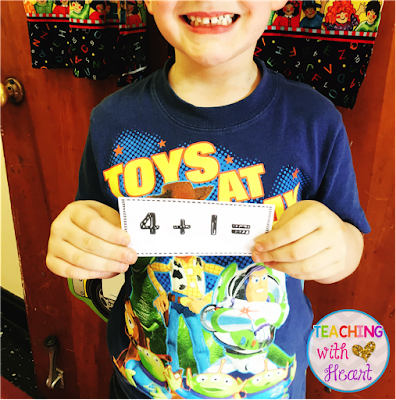 Since I teach guided math in small groups, it was easy to make sure all of my students got a chance to use the addition machine. They didn't have to wait for 16 other students to go before they got their turn. 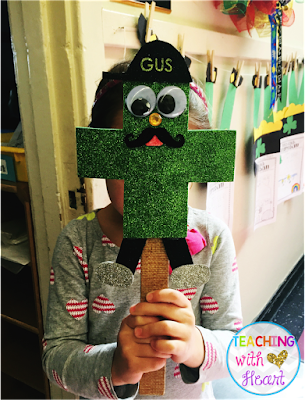 I also introduced them to our friend, Gus the Plus! We talked about how he likes to add two groups together, and practiced reading some addition equations with Gus in them. I had students come up one at a time to roll one of our giant dice and find out how many cubes we would put in our first cup and how many we would put in our second. 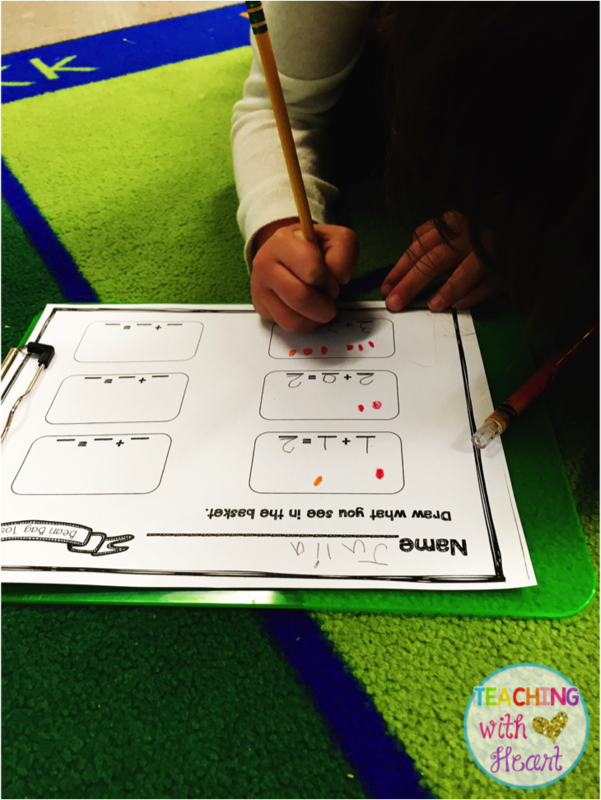 The rest of my kids were on the carpet with clipboards and their own recording sheets recording the addition equations we were creating. I also had one kiddo recording on the Promethean board to help my students who needed more support, and to allow the rest of the class to check their recording as they were going. Day number three kicked off our addition strategy exploration. 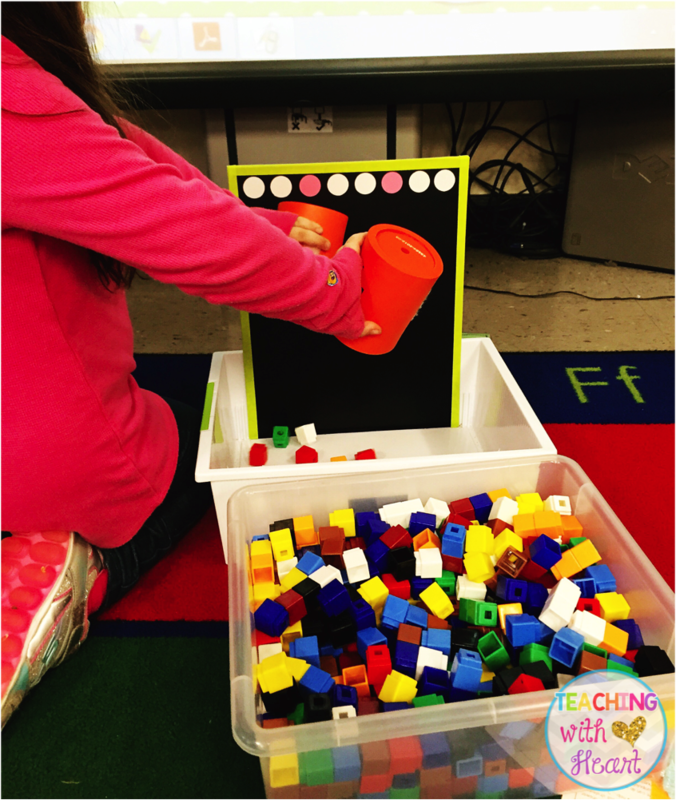 The first addition strategy that we explored was USE MANIPULATIVES. We resumed our usual guided math groups, and it was time to work with a partner. 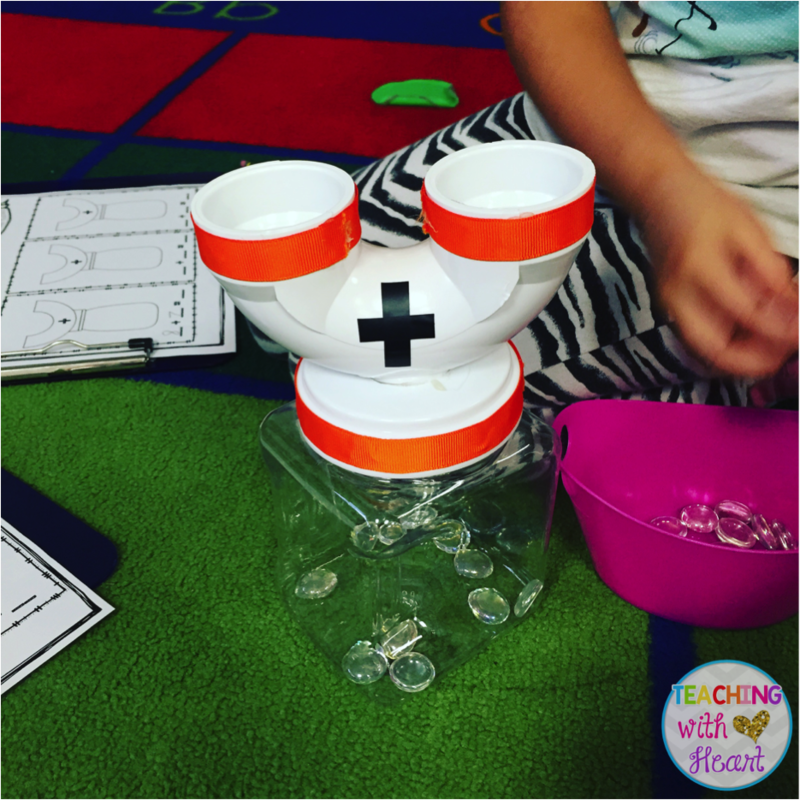 I was fortunate to inherit these awesome MINI math machines from my teammates, and we put them to good use! They used clear gems (you can find these at stores like The Dollar Tree or Michael's) to put the addends into the addition machine. 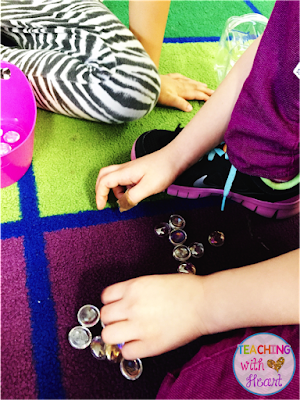 Then, they unscrewed the top, and counted the gems inside to solve the problem. 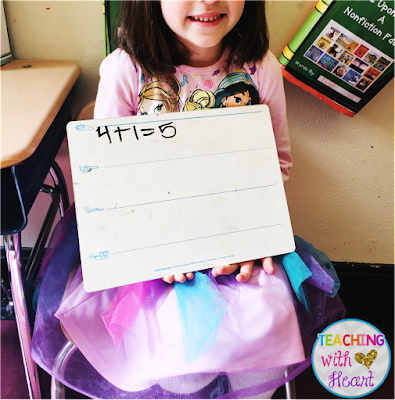 They recorded their equation and sum on their recording sheet. 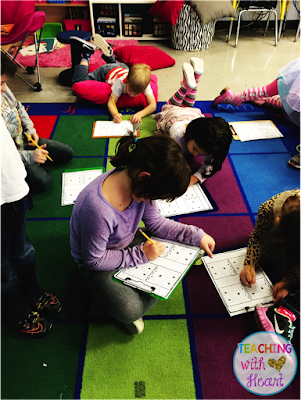 The next addition strategy we explored was DRAW A PICTURE. 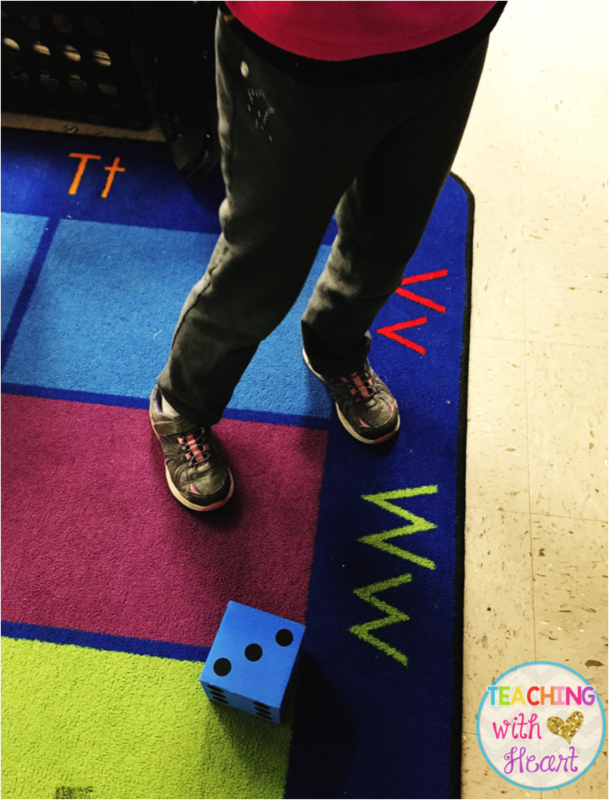 This was a favorite of my students' because they got to have a bean bag toss!! 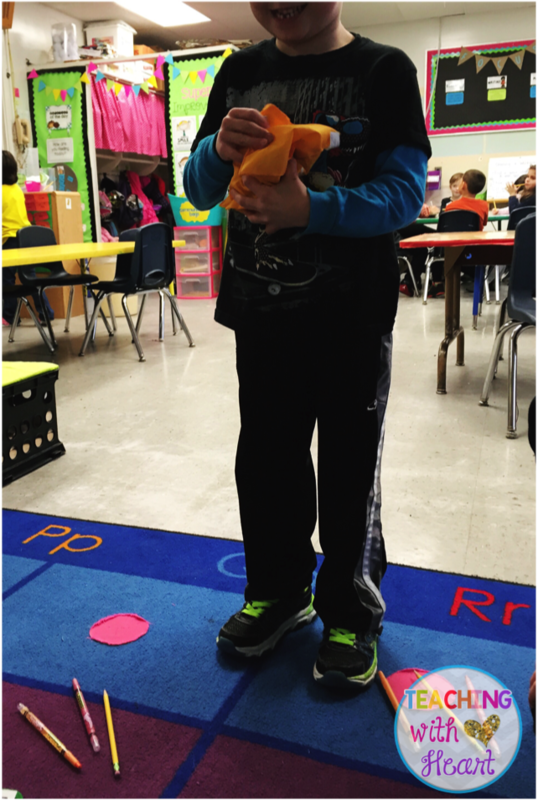 Each group had two colors of bean bags (5 total or 10 total depending on the group). 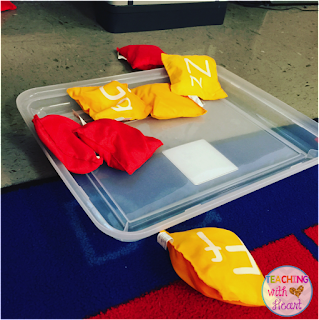 One at a time, one kiddo tossed their bean bags into a container. 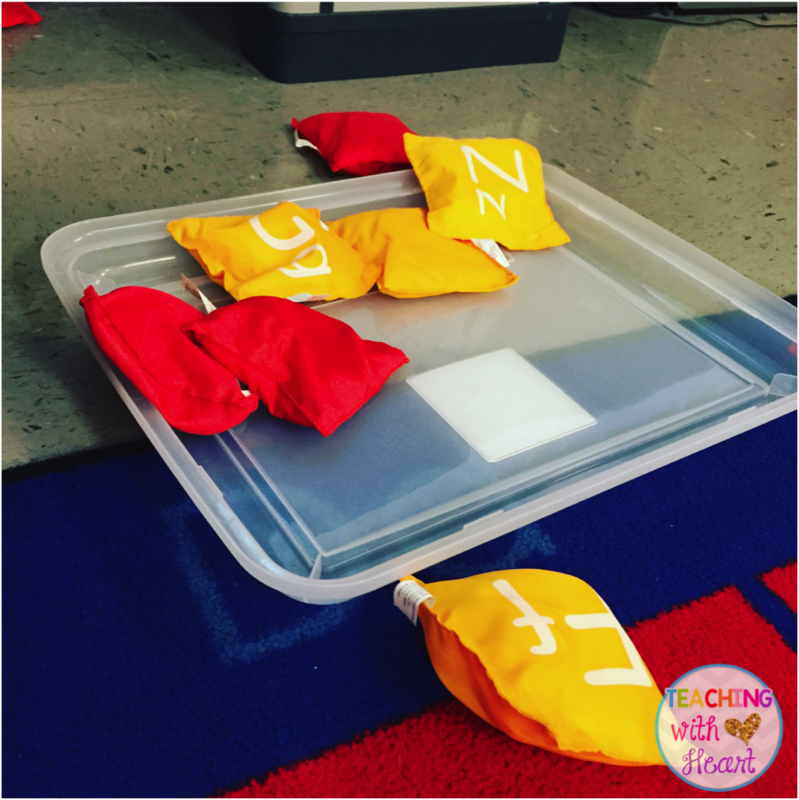 When they were finished, we looked at how many of each color were INSIDE the container. The rest of the group DREW how many of each colored bean bag made it into the container. Then, we worked as a group to create and solve the addition equation that matched the picture. This was a super engaging activity, and they didn't want it to end! The final addition strategy we explored was USE A NUMBER LINE. We explored this concept by using a real life number line! 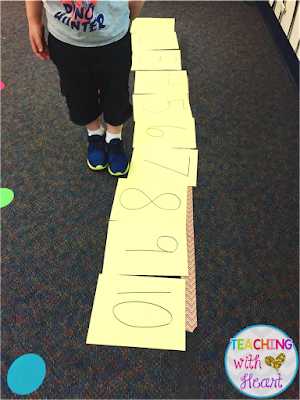 I wrote each number on a piece of paper, and we created the number line together on the carpet in our guided math groups. It was interesting to see the kids work together to place the numbers in the correct spots. 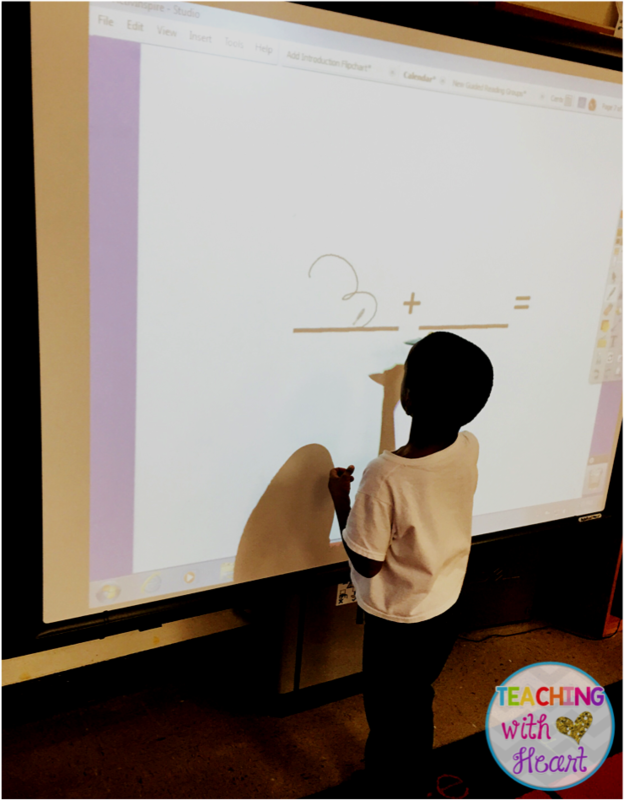 I posted an addition equation on the board, and one student came up and used the number line to solve the equation. We helped coach the kiddo, and talked about where he/she needed to start on the number line, and how many steps he/she needed to take. It was fun to work together as a group! They recorded the equation and their answers on a white board. 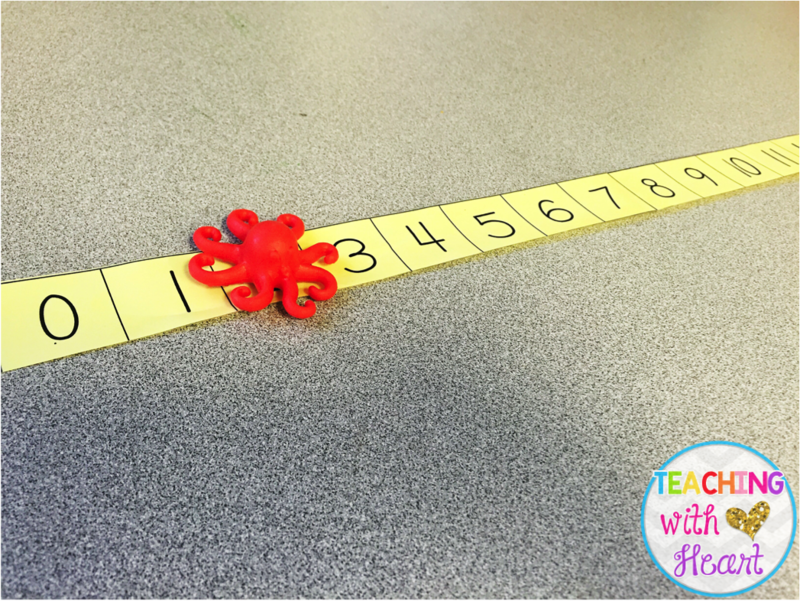 I have tons more addition games to help students' practice their fluency, and I'd love to share them with you! 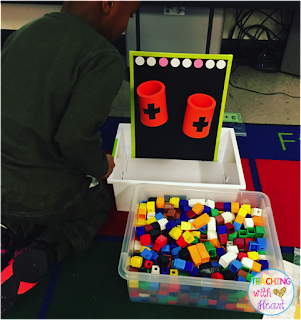 Check out my Meaningful Math Centers to get 10 addition math centers for your classroom! 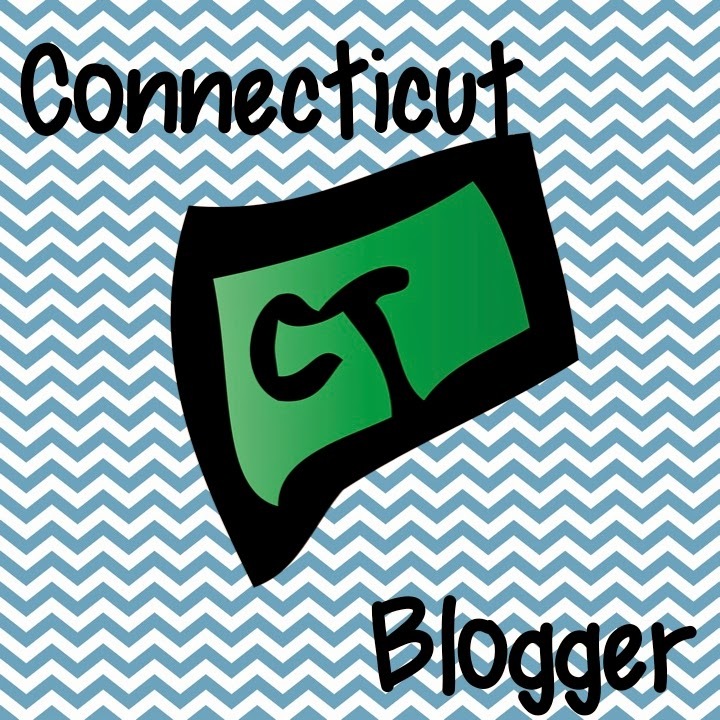 Want to check out more of my favorite math ideas? 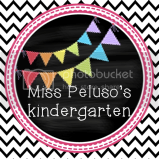 Follow my math board on Pinterest! Maths is a subject where most students strugge only because their primary concepts are not that strong. 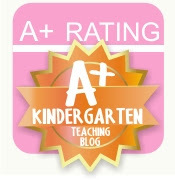 Learning addition in such fun way will surely strengthen every student's concepts.